Learn where to look for jobs and employment services that can help you to apply. Career advice and resources to help you look for a job or change careers. Know your rights and responsibilities and create a safe workplace. Find out how to report a health and safety incident at work. Get the practical skills and knowledge you need to join the workforce. Traineeships and apprenticeships offer a range of different vocational options with paid on-the-job training. The Queensland Government provides a range of services to help strengthen and grow Aboriginal and Torres Strait Islander businesses in Queensland. 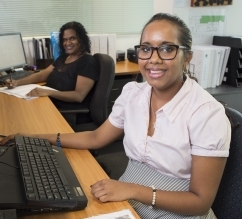 Skilling Queenslanders for Work helps Aboriginal and Torres Strait Islander Queenslanders develop skills, gain qualifications and get help to find a job and stay in the workforce. Whether you’re young or old, long-term unemployed or looking for your first real job, there could be a Skilling Queenslanders for Work program to support you. Find out more.